Javon Jackson – tenor sax. It was 1978. Disco had reached its glitzy peak in Milwaukee, a provincial Midwestern city where trends tend to hit a bit late. But jazz was still holding its own at intimate nightspots like John Hawks Pub, Sharon’s, Brother’s Lounge and Dr. Feelgood’s Jazz Riverboat, all places where Brian Lynch used to play. Back then, he was a brash young kid with bravura technique. Cocky and confident, he was part of the new guard that threatened the old. And he had an outrageous streak that intimidated and infuriated the squares on the scene. Decked out in bell bottom pants, platform shoes and Miles-style wrap-around glasses, he’d swagger onto the stage, horn in hand, and invariably blow everybody away. He had the LOOK, he had the ATTITUDE and he had the killer CHOPS to back up his boasts. Brian left town in 1980 to begin that learning process, moving to San Diego, where he gained some invaluable experience in the group of alto sax master Charles McPherson. He made the big leap to New York City in 1981 and quickly established himself on the city’s highly competitive music scene. Early gigs included work with George Russell’s band and with Latin bandleader Angel Canales. In October of ‘82, he hooked up with Horace Silver, an important gig that lasted three years and furthered Brian’s on-the-job education. In ’83, he also began working outside of Horace’s quintet when scheduling allowed, including stints with Latin stars Ray Barretto and Hector Lavoe as well as playing in the Toshiko Akiyoshi Jazz Orchestra. In 1987, after a brief period with the Frank Wess Quintet, Brian joined Eddie Palmieri’s progressive salsa-jazz ensemble. He continues to play with that stellar outfit off and on, time permitting, and he appears on Palmieri’s highly acclaimed Capitol/Intuition debut from 1989, Sueño. Around Christmas of ’88, Brian entered the ranks of Art Blakey’s Jazz Messengers, perhaps the best Christmas present a trumpeter could ever receive. All these varied influences come to bear on Brian’s second album as a leader for Criss Cross, Back Room Blues. It’s a paean to the trumpeter’s past glory in Milwaukee, to his present status as a well-respected Blakeyite and to his future as a bandleader in his own right. 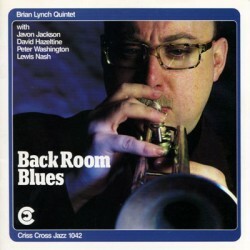 While Back Room Blues follows the formula that Brian established on his 1987 Criss Cross debut, Peer Pressure, recreating the classic sound of ‘60s Blue Note dates, it offers the soloists more room to stretch and also showcases five Lynch originals. The title cut comes from the year-long period from ’83-’84 when Brian fronted the house band at the Star Cafe on 23rd St. in New York. His old Milwaukee mate David Hazeltine was also on that gig, in between jobs with Jon Hendricks, and the two used to hold forth with such illustrious jazzmen as Junior Cook and Curtis Fuller. You can sense the rapport between the pianist and the trumpeter as Hazeltine nudges Brian ever-upward with sly-phrased block chords while drummer Lewis Nash expertly swings the quintet. Lynch’s lessons about dynamics and accents and pacing a solo, learned under the sage-like tutelage of Blakey, are put into practice here. Dig the tight tenor-trumpet lines upfront, a Messengers trademark, and listen for Brian’s quote from A Love Supreme on his well-crafted solo. One For Mogie, dedicated to Lee Morgan, is another swinging vehicle in the bristling hard bop tradition of the Jazz Messengers. Brian soars here with crackling high spirits, recalling Morgan’s work on Speedball from The Gigolo. Another great example of well-thought-out solo construction. And dig the classic tenor-trumpet-drum accents throughout the piece. Another Messengers motif. C.K.’s Bossa, named for another Milwaukee friend, Cathy Kaiser, is somewhat reminiscent of Morgan’s Ceora from the Cornbread album on Blue Note. Pianist Hazeltine turns in his most affecting solo here, with able support from former Messengers bassist Peter Washington. Also, listen for Javon Jackson’s sly quote from Girl From Ipanema on his tenor solo. Cramer St., an uptempo cooker that flaunts Brian’s bravado chops to the max, is an ode to another time and place. As Hazeltine explains, “That was the name of a band we had together back in the late ‘70s and also the name of the street where we lived with a drummer named Scott Napoli. It was kind of a haven for jazz musicians. It was the place where everybody crashed. Our doors were always open to jazz musicians, and we had plenty of them sleeping in various places around that pad.” Tenorist Jackson flows confidently on this quickstepper, throwing in some multiphonics and a few daring forays outside the changes. Hazeltine also digs in and burns with authority. Brian enters quietly on his solo, as if tip-toeing in the dark after-hours so as not to wake his fellow musicians sprawled out on the floor of his Cramer St. digs. He gradually builds his solo, unveiling that vigorous tone, and eventually reaches the kind of virtuosic peaks that would have patrons in a club hooting and shouting out encouragements. On the album’s closer, Hazeltine’s Confluence, the pianist offers blithe right hand comments while Brian flies over the changes with typical aplomb, again displaying a fluid, vocal phrasing that is full of confidence and always under control. And Back Room Blues is a laudable step in that direction.